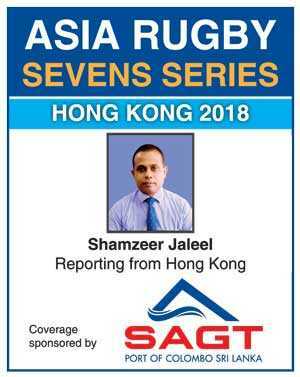 Both Sri Lankan Men’s and Women’s outfits will feel the heat in Hong Kong when they lock horns in the Asian Sevens 2018 first leg which will kick off on 14 September at the Hong Kong Football Club (HKFC). The Men’s outfit will be without some experienced seniors such as Ranjan, Muthu, Jason and Tharinda while the Women’s outfit will be out of touch on sevens rugby missing out on participation at the Asian Games 2018 in Indonesia last month. Sooriyabandara and his men are in a tough group, as they will play alongside Japan, China and Taipei in group stages. Sri Lanka will play China in the opening game and later take on Asian Games Silver medallists, Japan. They will face Taipei on day 2 (15). The top two finishers from each group will make it to the cup semi-finals, while the bottom two will play in the plate semi-finals. Same rule will apply for the Women’s event as well which will see eight teams locking horns for honours. Sooriyabandara representing national sevens outfit since 2008 will lead in his Maiden tour as skipper with regular skipper, Sudarshana Muthuthanthri, who was ruled out for three weeks due to a wrist injury which occurred in the recently- concluded Asian Games. Ranjan too will be badly missed by the Sri Lankan camp for this leg in Hong Kong but will return to the team for the Korean leg in two weeks. Jason Dissanayake and Tharinda Rwatwatte will miss due to personal reasons. Kevin Dixon, Adeesha Weerathunga, Naveen Henakankanamage and Dinuk Amerasinghe will come into the side. Former Katugastota Antonian, National Youth and Havies player, Dinuk Amerasinghe will make his senior debut after his tremendous performances at the Asia Under20 Sevens series in Hong Kong last month. Sri Lanka ended on number 3 in Hong Kong last year beating Philippines. Overall Sri Lanka finished 4th in the 2017 Asian Sevens series behind Japan, Hong Kong and South Korea. Sandika Hemakumari (captain), Charani Liyanage, Anusha Aththanayake, Thanuja Weerakkody, NJK Dilrukshi, Sanju Wijethilake, Wasana Weerakkody, Ayesha Kaluarachchi, Shanika Madumali, Ayesha Perera, Dulani Palikkondage and Randika Kumudumali. Srinath Sooriyabandara (Capt. ), Gayan Weeraratne, Danushka Dyan, Kavindu Perera, Sudam Sooriarachchi, Rehan Silva, Reza Raffaideen, Kevin Dixon. Adeesha Weeratunga, Buddima Piyarathne, Naveen Henakankanamage and Dinuk Amerasinghe. Head Coach – Peter Woods.